Kyiv’s independence day parade on 24 August 2018 featured an all-female parade unit, military aviation, 18 international delegations and soldiers from 10 NATO countries marching alongside their Ukrainian counterparts. 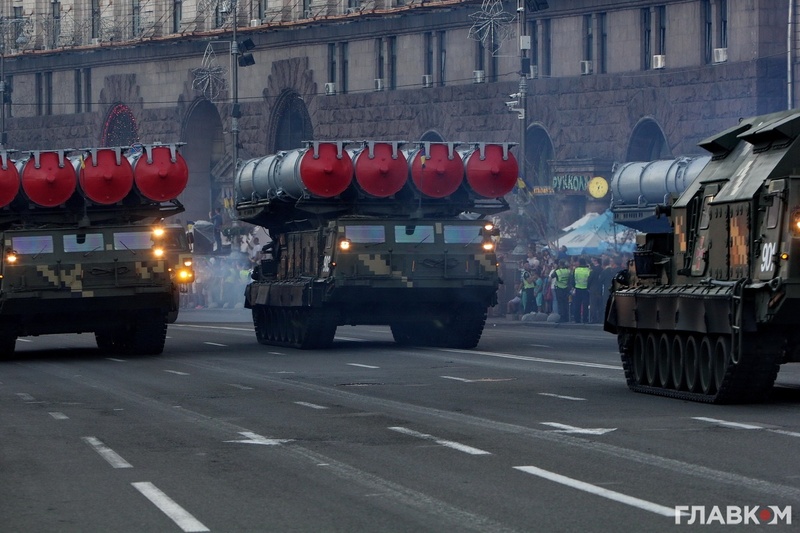 But apart from that, it offered an impressive exposition of military hardware: a special part of the parade was dedicated to the military equipment which is either being used in Ukraine’s Armed Forces or undergoing tests. Apart from the 40 units of heavy armored vehicles and 100 automobile vehicles, 30 artillery systems and 30 rocket systems, Ukraine flaunted off the Javelin anti-tank missiles it purchased from the USA not long ago. 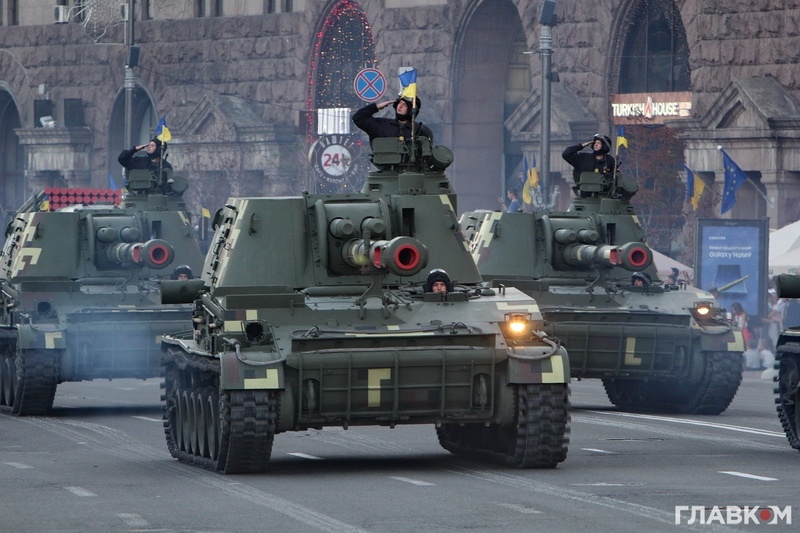 Although most of the equipment is of Soviet origin, the ongoing war against Russian-directed militants in Donbas has given a jolt to Ukraine’s military production, evidenced by the number of new or updated models of military hardware seen at the parade. As well, the updates reveal an ongoing transition to NATO standards. Here are the notable pieces of equipment, as reported by Glavcom journalist Yana Stepankovska from a parade rehearsal (all photos by Stanislav Hruzdiev from Glavcom). The T-84 is an updated version of the T-84 Oplot combat vehicle developed by the Morozov Kharkiv Design Bureau for Mechanical Engineering belonging to the state-owned Ukroboronprom. The tank body has multi-layered armor and is also protected by the Knife modern dynamic protection system and a system of electron-optic counteraction to guided weaponry. This tank meets NATO requirements with its 120mm gun, meaning that it can use shells produced both by Ukraine and NATO member countries. The T-64BV tank was also developed by the Kharkiv Design Bureau and is an updated version of the T-64B first presented in 2017. The T-64BV is equipped with thermal night vision devices, has additional elements of dynamic protection, and lacks the infra-red illuminator of its predecessor. 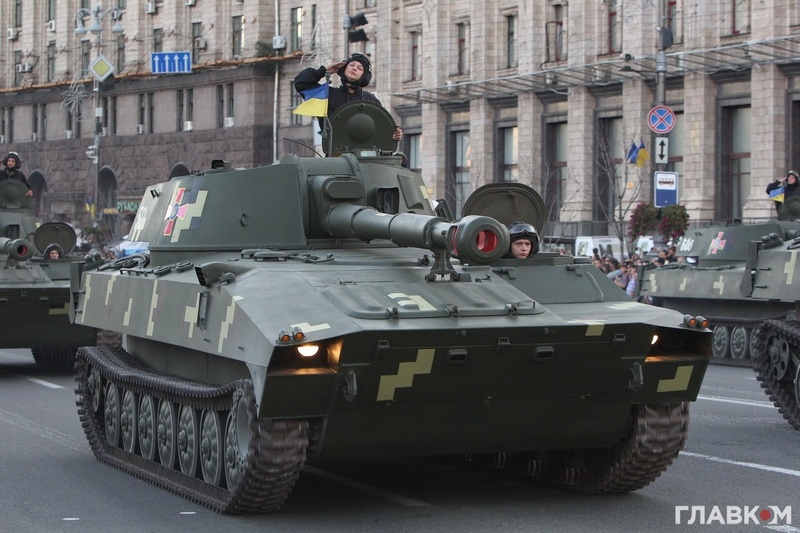 The BTR 3-DA APC is another Ukrainian model developed at the state-owned Kyiv Armor Plant. It contains the “Storm” modern combat module. Above is an artillery intelligence unit equipped with the AN / TPQ-36 radar which was provided to Ukraine as part of the USA military assistance program. Costing $1.5 mn, it has a detection range of 24 kilometers and was designed to adjust artillery fire and for counterattack activities. It can locate mortars, artillery, rocket systems and allows interacting during tactical fire control. The Dozor-B is a wheeled vehicle created by the Kharkiv Design Bureau of Machine-Building. The machine has triple protection, the latest navigation and communication systems. Dozor-B develops speeds up to 120 km per hour. 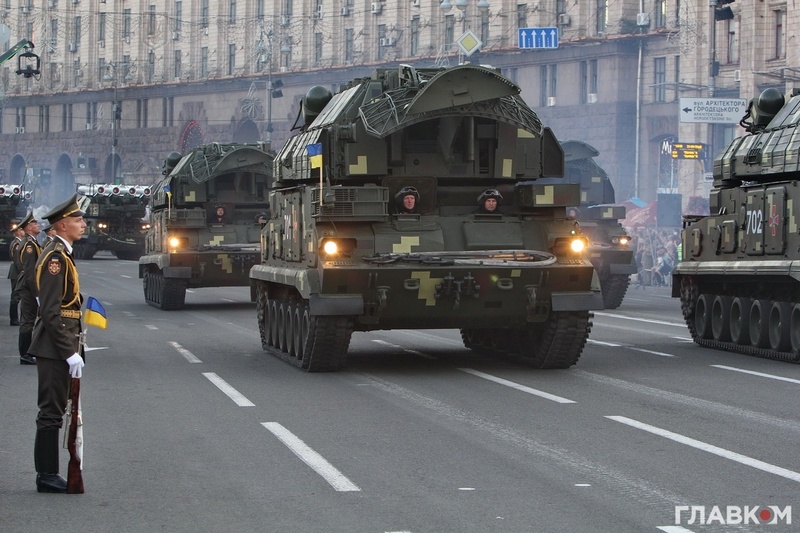 “Furiya,” “Leleka,” and PD-1 are Ukrainian-developed UAVs presented at the parade. They have a flight distance of up to 80 km. The Kozak-2 is a special armored vehicle manufactured by the Praktyka Ukrainian research-production enterprise. The machine is equipped with the Stugna-P anti-tank rocket complex also called the “Ukrainian Javelin” produced by the Kyiv-based Luch design bureau. Sutgna-P is designed to shoot troops, moving and still armored targets with combined, spaced or monolithic armor, including those with dynamic protection at a distance up to 5 km. 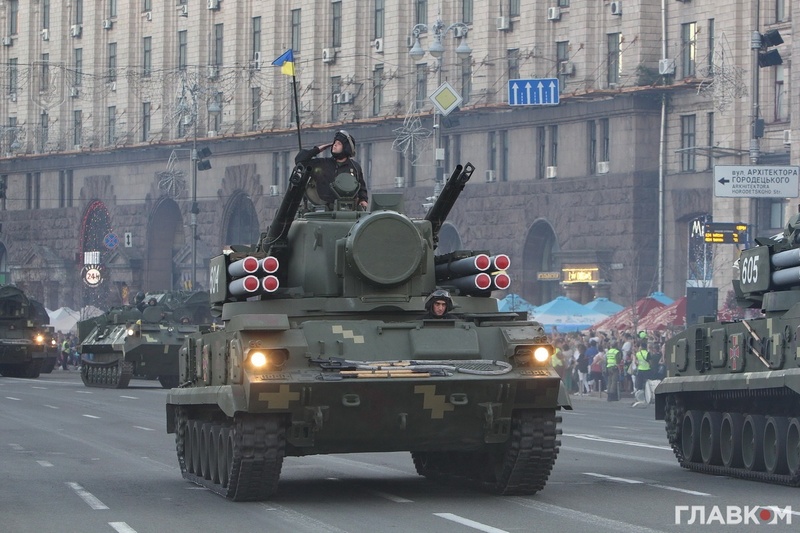 As well, the Ukrainian military demonstrated Javelin anti-tank guided missile systems during the Independence Day parade. In 2017, the US Congress approved a $47 mn package of military assistance to Ukraine which included 210 Javelin anti-tank complexes and 37 launch vehicles. 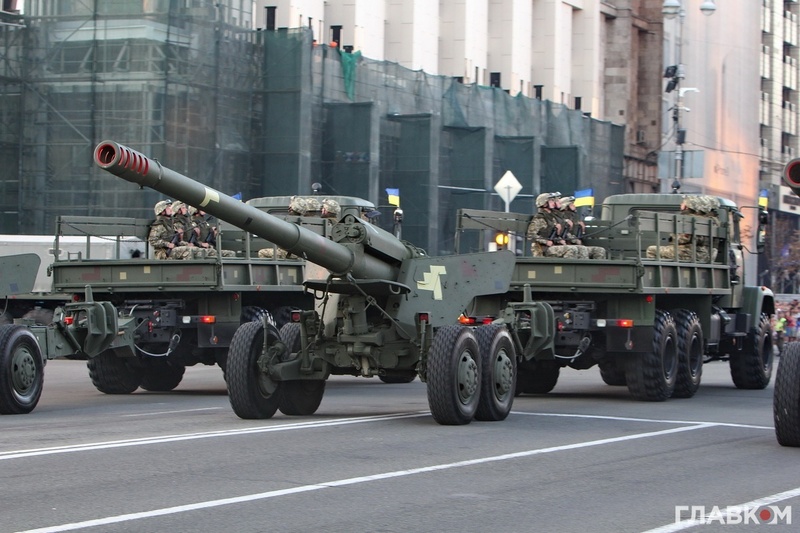 Ukraine received the Javelins in the spring of 2018. Javelins are designed to damage armored vehicles, fortifications on the ground, as well as some flying objects moving at low altitudes and speeds – helicopters or unmanned aerial vehicles. The main feature of the complex is that the rocket is self-guided and hits the tank in its least protected part – in the tower or the warmest place. This means that the destruction of a tank by a Javelin rocket is guaranteed. Javelins can hit their target at an impressive distance of up to 2.5 km. 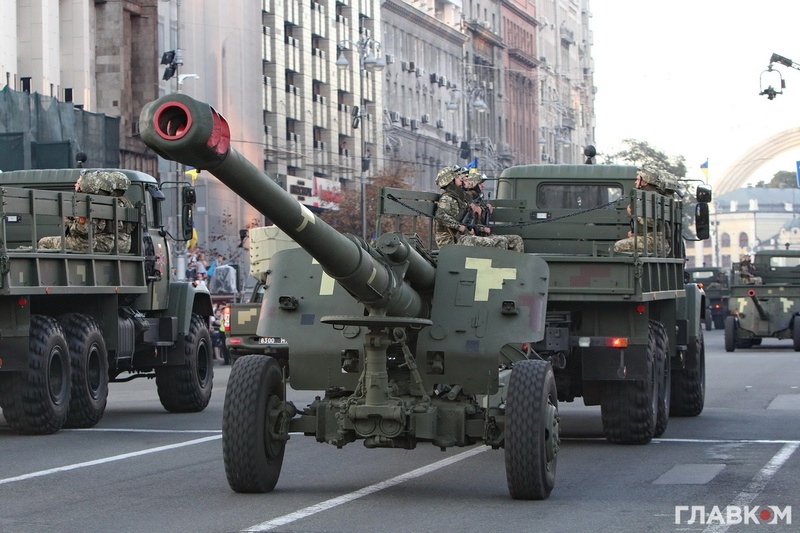 The Bohdana 155-mm self-propelled howitzer is a unique weapon for Ukraine. Its main feature is its NATO-standard caliber – 155mm – meaning that Ukraine is not only correcting its standards to NATO requirements but that it will have access to advanced global developments in ammunition for such artillery systems. The howitzer is equipped with an automated computer control and fire control system, firing active-jet projectiles at a distance of up to 60 km. The commander’s car with AK-1 control equipment is equipped with the Soviet-made Rapira anti-tank gun which is designed to defeat tanks, self-propelled artillery units, armored personnel carriers and other equipment. Other Soviet-era artillery systems include the Msta-B, Giatsint-B, 2S3 Gvozdika, and 2S1 Gvozdika. The latter fire at a distance up to 18 km. The Obolon-A automated fire control complex is a Ukrainian novelty developed at the Lviv-based Lorta factory. It allows processing data obtained from ground and air reconnaissance, as well as planning fire and transmitting targets for destruction. 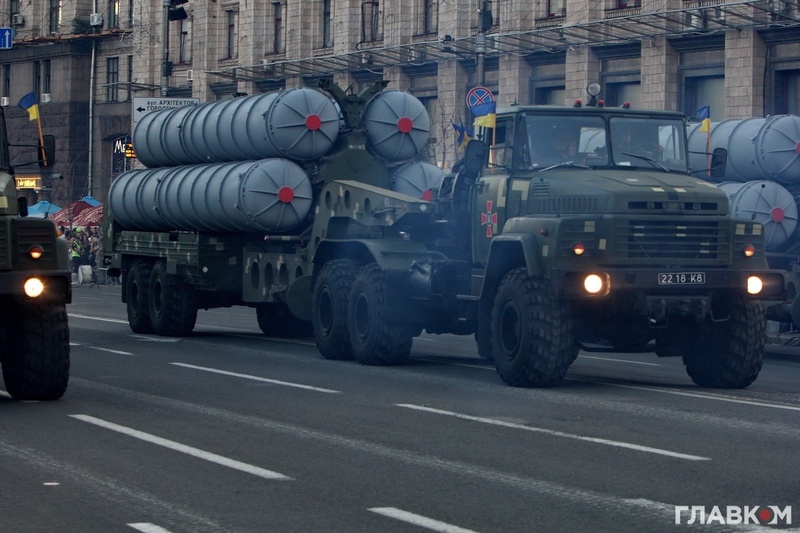 Also displayed on Khreshchatyk Street is the Verba multiple launch rocket system (MLRS). The vehicle is equipped with an automated fire control system and modern digital communication equipment. Verba is developed by the Morozov Kharkiv Design Bureau of Machine-Building. The system should, in the long run, replace the Soviet-era Grad MLRS. Verba’s developers have improved its command system and automatized the recharging. The ammunition consists of 40 rockets, the vehicle develops a speed of up to 85 km/h, and is capable of striking goals at a distance of up to 20 km. The Soviet-era self-propelled multiple rocket launcher system Uragan was modernized at Ukrainian enterprises and has powerful diesel engines. One volley of the system, containing 12 missiles, affects an area of 42 hectares and can reach targets at a distance of 35 km. The Vilkha MLRS has an automated control system for launching rockets and had its first test launch in February 2018. This is a Ukrainian analog of the Soviet and Russian Smerch MLRS [the key difference is that the Vilkha rockets are guided unlike the unguided Smerch ones – ed.]. Vilkha was developed at the Luch state design bureau. Its maximum range reaches 120 km, and the launcher contains 12 missiles. Each missile can be pointed to a separate target. The missiles can carry different warheads, depending on their purpose. The radar system Zoopark-2 is another new Ukrainian product used for determining the positions of enemy artillery over long distances. Tochka-U is a Soviet tactical ballistic missile designed to destroy the enemy’s nuclear attack, objects of supply and storage of nuclear weapons, missile systems and ground-based means of reconnaissance systems at a range up to 120 km. Tunguska is a Soviet-era tracked self-propelled anti-aircraft weapon designed to cover troops from an airstrike at small and medium altitudes. Tor is an all-weather low to medium altitude, short-range surface-to-air missile system also developed during Soviet times. 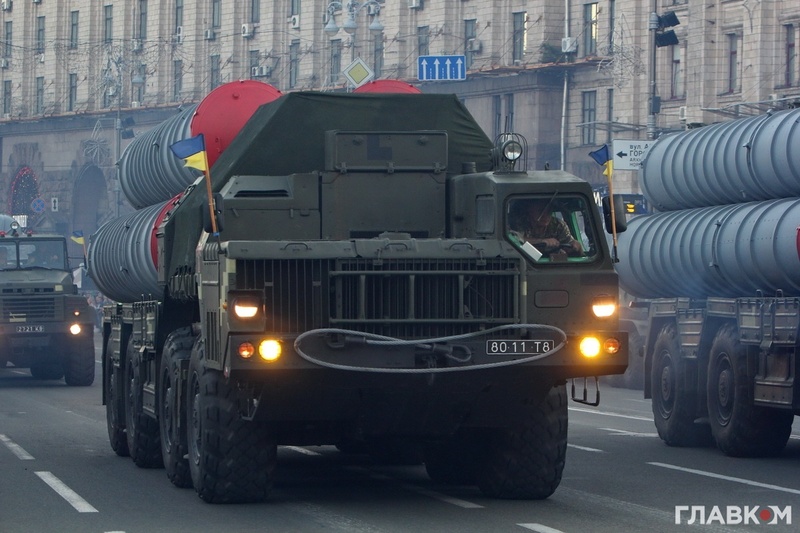 As well as the S-300 anti-aircraft missile systems of various modifications that are capable of destroying enemy aircraft, cruise missiles, etc. at distances up to 75 km and at altitudes of up to 2.7 km. And the S-300V1 complex is able to withstand the threat from Russian missile complexes Iskander and Kalibr. Work on the Sapsan operational-tactical missile complex started in 2009, but was stopped in 2013 by then Minister of Defense Pavlo Lebedev, who, after the Euromaidan revolution fled to occupied Crimea. Sapsan was created by joint efforts of the State Design Bureau Pivdenne and Pivdenmash. Now works on the project were restored. In the future, the missile complex will become a new Ukrainian development designed to defeat the enemy’s ground targets. While the Tochka-U tactical missile complex can strike targets at a distance of 120 km, Sapsan is planned of being able of striking a target 500 km away: a rocket for that is under development. The airborne component of the parade was headed by the Mi-8 helicopter. Four fighter jets, bombers, attack aircraft, combat helicopters, and air and sea transport aircraft flew in the air above Kyiv. In particular, the Mi-8 and Mi-14 helicopters were commanded by officers who relocated to mainland of Ukraine after the annexation of Crimea, and the Ka-25, the military transport aircraft An-26, the cargo military transport aircraft IL-76, accompanied by two multi-purpose Su-27 fighters, Su-25 and Su-24 attack planes. The novel development of the state-owned enterprise Antonov will also be shown – an An-178 transport aircraft. It was created to replace the An-12. An-178 has a changed form of the fuselage, a ramp for loading and unloading sized cargoes – it can carry up to 18 tons of cargo.